Big fields turned out to get a sneak preview of the Nationals course in December. the 2 sets of stairs weren't build yet but the single planks and the run-ups still gave everybody of taste of things to come in a December. the course was FAST. Super hard-packed grass that was mowed to about 5mm's. After yesterdays Capital Cup race, I was looking forward to a better result. the uphill paved start was less caotic than i'd expect. Tilford and his Trek/VW boys all over the front leading off the pavement and onto the grass. Entering the first set of barriers on lap 1, Tilford and Shadd Smith worked an early advantage while teammates Bill Stolte and Adam Mills settled in to 3rd and 4th. Behind them I found myself together with Joseph Smaltz (Team X) and we kept the gap to Bill and Adam from growing. Behind up the race was fragmenting but a large chasing group was now forming that had some serious fire power. The exposed course and light wind gave an advantage to the well-working group while me and Joseph continued but couldn't keep the gap. The large chasing group contained Tom Price, Bill Marshall, David Hejduk, Tony Wilhelm, Jeff Winkler, Cale McAnich, and Troy Krause. The pace was fierce as Wilhem and Hejduk fell away from the big group. I resigned that it was better to get caught and work(or hopefully draft) in the group than continue with Joe so I let the Team X rider slip away while I got swallowed up. Over the last couple laps everybody in the group was attacking each other and pushing every turn hard. On the bell lap, I sat comfortably on Bill Marshall's wheel before a sharp acceleration by Tom Price sent everyone sprinting for a wheel to get on. It killed me but I managed to get on a wheel of Cale McAnish but he had already lost the wheel he was on so it was over. My break-away companion Joseph Schmalz hung on for 5th, while Bill Marshall won the sprint for 6th with Wikler, Price, and Krause. McAninch followed in by himself for 10th while I tooled in for 11th. A packed field came out to do battle at a brand new venue at Hummer Sports Complex in Topeka. The course was 3km of mostly fast grass. The paved start was slightly uphill and it didn't take long for the favorites to make their way to the head of the race. Steve Tilford and Bill Stolte used the first couple laps as a warm-up so the race stayed generally together. One they started racing\, they were off and gone, leaving a chase group of myself, Adam Mills, Tony Wilhelm, David Hejduk, Bill Marshall, Jeff Winkler, and Karl Kiester from Denver. This pack stayed together for a few laps with no real group forming behind us. About midway through the race, Wilhelm, Mills, and Kiester got off the front of our group. They slowly pulled away leaving me, Marshall, Hejduk, and Winkler to race out the closing laps. We would eventually pass Kiester having suffered a flat. Coming into the closing laps, we all through in digs to get away but the course didn't lend itself to solo glory, so a sprint finish was un-avoidable. Coming into the last steep climb before the run-up, I lost the wheel of Hedjuk and Marshall but was able to get a small gap on Winkler. I held that over the finish just trailing in behind Hejduk and Marshall. 7th doesn't sound good out off 16 but it was a pretty stacked field and everybody in front of me was at least pretty fast, and I still had fast guys finish well behind me. I always race better on the 2nd day of a double-race weekend so tomorrows Boulevard Cup race on the National Championships course should be a good one. ....your co-worker is wearing overall's to work. It's an OFFICE JOB that is supposed to have a dress code. Having worked in California most of my employed life, were an office job requires a minimum amount of clothing common sense, I find this completely un-believable. He was born, raised, and never lived anywhere else but here so that may explain things. As far as dressing for success, this guy sho ain't gitten 'r dun! Suffering the absolute WORST sinus problems due to the heat and wind, I amazed myself on Saturday. The weekend only got better. 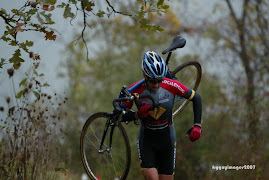 Saturday Chris and I made the trek up to Omaha for the first 2 races of the Nebraska Cyclocross Series. The never-ending summer here in the Midwest, a constant cycle of Fall-like weather, then a return of heat and wind has every plant blooming and my sinuses just go ape. This week was the worst. I've been on sinus med's, Clariton, and Vick's Vapor Rub just to get though the day and night. Saturday's race was very hot. 80 plus. Not cross-weather at all and not was I excel in. I had a great start and settled in with LocalCycling.com teammate Brad Sullivan and Trek/VW's Tony Willwelm. Brad and I tried to tag-team Tony a bit. Brad was riding great and I figured I would drop dead at any moment. Brad got a gap on me and Tony so I turned off the gas since Tony wouldn't pull though. Coming up fast was Lincoln Industries Troy Krause and a hard charging Darren Schlake. Tony fell off my wheel and I was know along in 2nd with Tony going backwards though the field. I didn't have the strength to get back up to Brad so I put 'er in cruise mode and and held on for 2nd. A the finish, i was completely DONE. Lung cheese was plentyful. Weather report showed Sunday would be much cooler low to mid 50's and windy. I recovered amazingly overnite and felt great. I took the lead right away and pushed the pace early to thin the field out. I used the long gravel climb (that was a long gravel descent yesterday) to my advantage and pushed it hard up it every lap. Just like yesterday, It came down to myself, Tony Wilhelm, and teammate Brad at the front and pulling away. I would push the pace on the sections of the course that suited my and ease up and let the others great the wind and recover. Brad eventually had to ease up and fell way while Tony and myself continued to throw everything at each other. One trip through the sand pit, we found ourselves side-by-side and neither of us giving an inch. I made several big efforts to get rid of him before the finish but he stayed right with me. I let Tony go by me right before the long head-wind straight. That gave me about a minute of rest before the 180 turn at the top and became a tail-wind drag race for about 200 meters to the line. I played it calm as cucumber and waited till the tail-wind kicked in and lauched my sprint so I could get to a trick little s-turn around some trees right before the finish line. Worked PERFECTLY. Tony's not exactly up to his usually speed so he'll be tough in the up-coming races. Ciao. Need to go pop some sin-u-tabs. 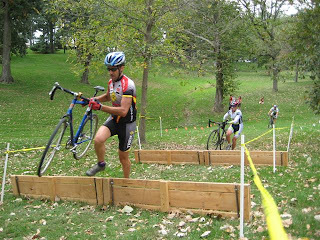 Following yesterday completely horrific performance up at Spooky Cross in Des Moines. I wasn't sure what to expect the following day. Sunny and warm temps turned taking illegal water-bottle hand-ups a fine art without the USCF official catching on. 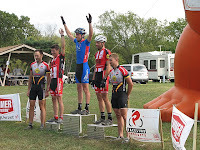 I got a perfect start right behind Shadd Smith (HRRC/Trek Stores) , Bill Stolte (HRRC/ Trek Stores), and Mathew Ankney (Mercy Cycling). Shadd and Mathew checked out rather early leaving Bill Stolte, Myself, and Brad Sullivan (Local Cycling.com) in chase group #1. Behind us, a large chase group #2 had formed with some farily fast guys including David White (KCOI Boulevard Brewery), David Hejduk and Adam Lang( both Team X), and Cameron Chambers (Badger), and a few others. About 20 minutes into the race I started loosing power and dropped off from the first chase group with Bill and Brad and was caught by the 2nd group. All six guys in the 2nd group blew by me and I wasn't even staying with that group. At about 40 minutes in, I was feeling better and noticed that 2nd group was fragmenting and I was gaining some ground back. The moral took a little boost when I started catching them back. One by one I was able to bring all 6 of those guys back and get back on the final podium spot in 5th. Sometimes you just feel really good or really bad with no real explanation of how or why. Rode like a true champ.....for the first couple laps anyway. Then the champ turned into a chump. After leading the first lap and getting the prime, I just didn't have it when the race actually got fast. Got a descent start and rode up a very steep, greasy hill while everbody in front of me ran. I rode right by everybody and ended up leading by the top. That probably wasn't the best strategy considering the guys I was now in front of. After crossing the line to take the lap 1 prime, the legs just turned to rubber and the wet spongy grass seemed to feel 1 foot thick. I immediately dropped back to 5 th and tried to hold off Troy Krause but the moral was sliding and so was my pace. The misery wasn't over. Now in 6th, I had another guy bridging up to me and couldn't hold him off. I figure after a 3 hour drive, my legs just weren't really in the mood. Another race tomorrow at Chris Cross - in Lawrence, KC. Saturday’s race in Newton Iowa, being the first one of the year, was just an exercise in getting-the-cobwebs-out. Got the PERFECT start which is a miracle considering it was a LeMans start with us running up the run-up and over the barriers to our bikes at the top. Led for a little bit in the early laps, but didn’t have the next higher gear to go with the attack of Josh Johnson (Big Shark) and John Olney (ICCC). Unfortunate mechanicals by Brian Eppen and JJ Bailey turned what would have been a 6th place into a 4th. Sean Walker (Atlas Core) pulled away from me in the closing laps to take the 3rd and final podium spot with me in 4th. Sunday’s race was a LOT DIFFERENT. Day 2 effects some racers different than others. This time I had the next higher gear were as some of the fast guys from Saturday seemed to go backwards. Sunday’s race had a traditional start and the bonus of a pair of Oakleys to the leader of the first lap. They did this crap last year and it makes for an “interesting” first lap. You’d be surprised how many people try to hole-shot off the start and then clog the race up 2 turns later. I got a bad start but at least I have the ability to get my way back into it within a couple turns. I wasn’t intending on going for the prime but thought is prudent to stay at the front anyways just in case I got itchy feet. Josh Johnson and Brian Eppen both seemed like they wanted the shades so I was more than happy just staying on their wheel. We all came through after lap 1 together with Brian taking the shades without much of a sprint from Josh or myself. 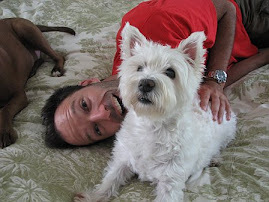 We stayed together for a few laps before Brian started to check out. Josh got a small gap on me before a spectacular explosion. I quickly caught and dropped him, only to find him back on my wheel and than attack me the following lap. Than it happened again. I was just keeping it steady and he was yo-yo’ing like no tomorrow. He recovered with a couple laps to grab 2nd place while I had 3rd wrapped up. Meanwhile, the race behind us was falling apart. Saturday’s 2nd place John Olney crumbled at some point and DNF’d, Saturday’s 3rd place Sean Walker faded to finish 1-lap down as many did.